Eskom’s Group Treasurer Andre Pillay will take the stand at the Commission of Inquiry into State Capture in Parktown, Johannesburg on Friday morning. On Thursday, former Communications Minister Siphiwe Nyanda told the Commission about what he said were rumours that were circulating among ANC National Executive Committee members on an impending Cabinet reshuffle that would affect him in 2010. 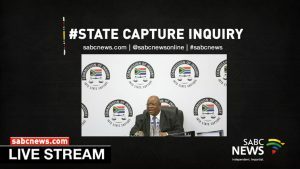 The post WATCH: Commission of Inquiry into State Capture appeared first on SABC News – Breaking news, special reports, world, business, sport coverage of all South African current events. Africa's news leader..